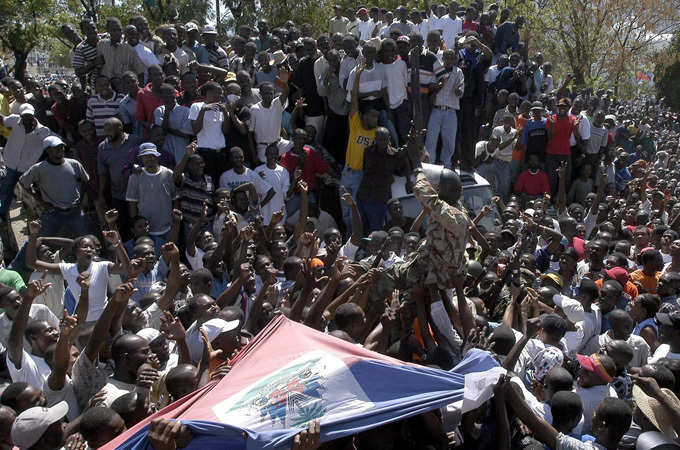 Haiti's brutal paramilitary campaigns received scant media coverage, while "political violence" was decried at length. "Haiti needs help ... the Americans are welcome here. But where are they? We need them here on the street with us." The whereabouts of the ever-elusive Americans are of course hinted at two paragraphs later, when we learn that "the White House said more than 11,000 US military personnel are on the ground, on ships offshore or en route". Elsewhere, French Co-operation Minister Alain Joyandet was quoted as commenting in reference to seemingly skewed US priorities: "This is about helping Haiti, not about occupying Haiti". As foreign military monopolised the Port-au-Prince airport, teams of paramedics and first responders were delayed in the critical hours immediately following the earthquake. Subscribers to the fantasy that the US is somehow qualified to counteract violence and install order in the Caribbean nation would do well to peruse a new book entitled Paramilitarism and the Assault on Democracy in Haiti, in which author Jeb Sprague masterfully documents - among other topics - the detrimental role of US and fellow international actors in Haitian history. Offering new evidence obtained through interviews and a massive amount of formerly classified US government documents, the book clarifies how Haiti's post-quake reconstruction rests on a foundation of total impunity achieved by the country's most brutal paramilitaries and their financiers. As Sprague notes, the US occupation of Haiti from 1915-1934 under "the pretext of possible German encroachment during the First World War… caused the deaths of an estimated 15,000 Haitians and saw the imposition of slave labour". It also imposed "a modern army, one that would continue the US occupation long after US troops were gone", functioning on behalf of the Haitian elite and their American counterparts. Observes Sprague: "The US occupation wedded the country’s future to North American business interests." Later, during the reign of Francois "Papa Doc" Duvalier in the 1960s, US Marines trained the dictator’s Tonton Macoutes paramilitary force, known for "leaving bodies of their victims hanging in public, a clear warning to anyone stepping out of line, most especially leftists, socialists and pro-democracy activists". Linked to the business elite and the military itself, the Macoutes were "vital for upholding a system based on severe inequality and class privilege". Following the transfer of power to Jean-Claude "Baby Doc" Duvalier, a brutal counter-insurgency force known as the Leopards was trained and equipped "by former US marine instructors who were working through a company (Aerotrade, Inc and Aerotrade International, Inc) under contract with the CIA and signed off by the US Department of State". Prior to becoming Haiti's first democratically elected president in early 1991, the young liberation theologian, Jean-Bertrand Aristide "denounced the historic role of the United States in founding, arming and training Haiti's military, which had been responsible for so much of the violence in Haitian history". Sprague quotes Aristide: "They [the United States] set up the Haitian Army, they trained it to work against the people". Indeed, it would be difficult to argue that the army was working for the people by massacring citizens attempting to vote in 1987, or by overthrowing the newly elected Aristide in September 1991 and slaughtering his supporters. Aristide's coup-inducing crimes included inviting street children and homeless persons to breakfast at the National Palace and endeavouring to raise the daily minimum wage from $1.76 to $2.94. As Joanne Landy wrote in the New York Times in 1994, the latter effort was "vigorously opposed by the US Agency for International Development because of the threat such an increase would pose to the 'business climate', particularly to American companies paying rock-bottom wages to workers in Haiti". Aside from USAID, another relevant euphemism from the coup period was the Front for the Advancement and Progress of Haiti (FRAPH), a paramilitary organisation intimately linked to the Haitian military that assumed the task of terrorising the non-elite masses under the military junta. "Internal US government documents reveal that FRAPH was founded in part at the behest of the US Defence Intelligence Agency," Sprague notes. After years of brutality and corruption, the military dictatorship faced growing resistance at home and abroad. Aristide was thus reinserted in his lawful post in 1994 in exchange for, inter alia, committing to be more attentive to the needs of the US agriculture industry and drastically slashing tariffs on imported rice. Upon reinstatement, he logically moved - with overwhelming public support - to disband the armed forces and the section chiefs (the hated rural constabulary). His government, and the elected governments that followed him, also gathered testimonials from thousands of victims of paramilitary violence and undertook judicial proceedings to prosecute military and paramilitary criminals. However, as researcher Eirin Mobekk has critically pointed out and Sprague has underscored, "only the army as an institution was dissolved… In a country where the army had run political life for decades it was an illusion to think that its networks would disappear with the removal of uniforms and the use of its buildings for other purposes". US contributions to the dissolution of the army included maneouvering to insert allied Haitian ex-military officials into what was supposed to be a civilian police force and eliminating officers seen as overly loyal to Aristide or less than enthusiastic about the coup. Some Haitian police officers were trained in the United States, where they were susceptible to overtures by the CIA, which also funded various FRAPH leaders and other paramilitaries. Given the high level of impunity enjoyed by military and paramilitary members who had committed atrocities - not to mention US insistence on a full amnesty for the coup perpetrators - it is somewhat less than astonishing that Aristide's re-election in 2000 also culminated in a coup d'état. Instrumental in the overthrow was the Revolutionary Front for the Liberation of Haiti (FLRN), which as Sprague explains was "led by renegade police officials who were from among the same ex-FAd'H [Haitian Armed Forces] pushed into the country’s new security force by the United States in the late 1990s". Backed by some wealthy Haitians, neo-Duvalierists, sweatshop owners, and government and army officials from the neighbouring Dominican Republic (who didn't want Aristide's anti-military, pro-human rights rhetoric rubbing off on their own citizenry), the FLRN staged incursions into Haiti from Dominican territory with the ultimate goal of forcing the re-establishment of the Haitian army. Of course, the sign of any good army is its ability to safeguard the domestic population, and these incursions provided the FLRN with an opportunity to showcase its skills - which it did by massacring and assaulting supporters of Aristide's Fanmi Lavalas party, often with sickening tactics. Citing formerly classified US embassy cables, Sprague uncovers how a small but powerful fifth column within the government was also working to undermine Aristide. According to Sprague, it is likely that French and US intelligence facilitated the paramilitary insurgency in some way, while "the International Republican Institute (an organisation funded by the US government that promotes 'democratisation programmes' around the world) provided a forum through which the [Haitian] political opposition strengthened its ties with the paramilitaries". As journalist Max Blumenthal has documented, the IRI benefitted in its underhanded dealings from the diplomacy of Roger Noriega, an Iran-Contra-era figure recycled into the Bush II administration along with his Cold War Manichean fantasies according to which Aristide and anyone else with less than extreme right-wing political convictions is a communist demon. "During Latortue's brief stint in office, 2004 - 2006, Haiti experienced some 4,000 political murders, according to The Lancet - while hundreds of Fanmi Lavalas members, Aristide supporters, and social movement leaders were locked up - usually on bogus charges. Latortue's friends in Washington looked the other way." Sprague, meanwhile, observes that "Bill Clinton's [former] policy of inserting a handful of ex-FAd’H criminals into Haiti's police force… was now put on steroids" and that "in 2004 -5 the United States and the UN oversaw the recycling of 400 ex-army paramilitaries into a revamped police force" - paving the way for yet more repetitions of history. Why is it that Haiti's brutal paramilitary campaigns received scant international press attention while quantitatively and qualitatively inferior political violence by a small number of Fanmi Lavalas supporters (which occurred in the context of clashes with the opposition) was decried at length? Obviously, media coverage is shaped by geopolitical and financial interests, with the terms of events defined by the powerful. This is how, for example, terrorism conducted by the US and Israel becomes "counter-terrorism", "self-defence" and "democracy promotion" in the Western mainstream media. Sprague documents how, in the case of Haiti, the press in the US, France, Canada and other locales undertook to demonise Aristide and rebrand the violent and unpopular uprising against him as non-violent and popular. As US-trained FLRN commander Guy Philippe remarked to journalist Isabel McDonald following the coup: "[The] international media, the media leaders helped us a lot. And thanks to them we were able to overthrow the dictator. And without them I don't think that we could have". "Obviously, media coverage is shaped by geopolitical and financial interests, with the terms of events defined by the powerful." "During his tenure, the UN International Civilian Mission learned, dozens of suspected gang members were summarily executed, most of them by police under the command of Philippe's deputy. The US embassy has also implicated Philippe in drug smuggling during his police career. Crimes committed in large part by ex-military policemen are often pinned on Aristide, even though he sought to prevent coup-happy human rights abusers from ending up in these posts." Farmer also noted that "Philippe has been quoted as saying that the man he most admires is Pinochet". The bloody legacy of the Chilean dictator offers a reminder of how helpful US-backed coups and violence can be when it comes to introducing neoliberal reforms. "The interim government laid off between eight and ten thousand civil sector workers, many from the poorest slums of Port-au-Prince. Other programmes under the Aristide government, such as subsidised rice for the poor, literacy centres and water supply projects, came to a halt following the coup d'état." The long-fantasised-about mass privatisation of Haitian state assets, however, appeared more difficult to pull off - until, that is, the country was shattered by the 2010 earthquake and control over Haiti's energy, water and other sectors was divvied up between international players like the World Bank and USAID. The 2011 debut of singer-turned-head of state Michel Martelly, elected with the support of a mere 16.7 per cent of the electorate and described by former Financial Times journalist Matt Kennard as a "shock president" prepared to enforce economic shock therapy, seems to have set the stage for the conversion of Haiti into a neoliberal fairytale kingdom. It is fitting that Martelly, whose presidential objectives include a resurrection of the Haitian armed forces rather than the pursuit of projects benefitting the majority of the nation's citizens, is himself a longtime close associate of Duvalier's paramilitary Tonton Macoutes. Belen Fernandez is the author of The Imperial Messenger: Thomas Friedman at Work, released by Verso in 2011. She is a member of the Jacobian Magazine editorial board, and her articles have appeared in the London Review of Books blog, AlterNet and many other publications.